Our culture is obsessed with the aesthetic results of fitness, but the real wealth of a regular workout is found in the practical benefits: a stronger, better-functioning body and a clearer mind. Science has shown that physical exercise can extend our lives, lift our spirits, and prevent cognitive decline more reliably than anything else we can do. Despite recent discoveries of how critical exercise is to our well-being, most of us are moving less than ever. Only 20 percent of Americans get the 150 minutes of strength training and cardiovascular activity per week recommended for optimal health, according the Centers for Disease Control and Prevention. There are several reasons why we don’t move as much as we used to. Modern conveniences have eliminated the need for a lot of the physical activities our ancestors were forced to do. Now, even if we want to exercise, it becomes one more thing we have to cram into our already busy day. Perhaps that’s why CrossFit, boot camp, and other intense workout styles have become so popular over the last decade. The sales pitch promises everything we want to hear: rapid fat loss, more energy, elevated mood, improved lung capacity, and a stronger heart in less time, plus research that backs up all these claims. To make these claims come true, however, you have to be able to push yourself—and know when to take it easy. The technique behind this type of workout is called high-intensity interval training (HIIT). HIIT can be applied to any form of heart-pumping exercise—just add more intensity. Picture calisthenics in fast forward. Unlike traditional cardio—in which exercisers aim for a steady yet moderate pace for half an hour or more—HIIT demands that you give it your all and then ease off for a moment, alternating short bursts of intense effort with small periods of rest. In terms of fitness goals, this alternation of work and rest really pays off. Studies show that HIIT engages more muscle fibers and burns more calories in a shorter amount of time compared to conventional workouts. It also keeps your metabolism revved up for 24 hours after your exercise is finished. In theory, the more intense your HIIT routine, the sooner you will see results. But this only pans out if your body is up to the challenge. Going too hard, or too often, can easily result in a setback. Kai Marshall is a personal trainer and strength coach in Fort Worth, Texas, who specializes in HIIT. He says high-intensity exercise can be good for everyone, as long as they respect their bodies’ limits. “You want to be working out hard, but you don’t want to be past the point where you’re going to hurt yourself,” Marshall said. The added intensity of HIIT brings with it a greater risk of injury, and Marshall says the biggest offender is CrossFit. This advanced form of HIIT has earned a reputation for quick results, but for those who are new to exercise, it may do more harm than good. Proper form is important when doing any exercise, but it is especially crucial with HIIT. Repeatedly straining joints, due to poor alignment, at high speed can end up damaging your body. Dr. Armin Tehrany, honorary surgeon of the New York Police Department and founder of Manhattan Orthopedic Care, sees a significant number of knee and shoulder injuries due to HIIT. Most of the sprains, meniscus tears, cartilage damage, and other orthopedic injuries that fall under his care typically result from CrossFit. And it’s not just beginners. Tehrany says a lot of his patients who have a long history of working out may not notice the degenerative process as it develops over months or years. A sudden increase in intensity thrust upon a weak or compromised area becomes the final straw. While people can get caught up in the fast gains of a HIIT routine, Tehrany urges them to remember the fundamentals. “It’s important to balance the musculature around the joint with proper stretching, strengthening, and prevention program exercises,” he said. The benefits of physical exercise are created through a biological principle called hormesis, which holds that a small, controlled dose of stress can condition your body to better handle the unpredictable stresses of life. Strength training and aerobic exercise push your body beyond its normal activity level. Your heart, muscles, and entire cardiovascular system improve under the increased demand. Using smaller yet more intense doses of stress, HIIT quickens the pace of improvement. However, the body still has to be stable and flexible enough to withstand the intensity you throw at it. And that can take time and patience. Physical therapist Dr. Karena Wu, owner of ActiveCare Physical Therapy in New York City and Mumbai, says it’s hard on the body to jump into high-intensity exercise if it’s been a while since you’ve worked out. Your muscle contractions must increase when performing a high-intensity regimen, and this in turn increases lactic acid buildup and muscle soreness. Some soreness is good—your body makes gains when you push past the point of comfort. However, if you don’t give your sore body ample opportunity to recover, your muscles won’t be able to generate a good contraction the next time you exercise, raising the potential for strain and injury. Wu mentions one patient who went crazy with abdominal exercises—leg lifts, planks, and other belly-busting routines. The next day, he couldn’t sit up because his abs were strained and swollen. “He actually tore his abdominal tissue because of the number of reps as well as the back-to-back number of exercises,” Wu said. We intuitively seek to undo our sedentary sins by pushing ourselves in the other direction. HIIT can help speed up this process, but the pursuit of a ripped body in record time can cloud our sense of balance. 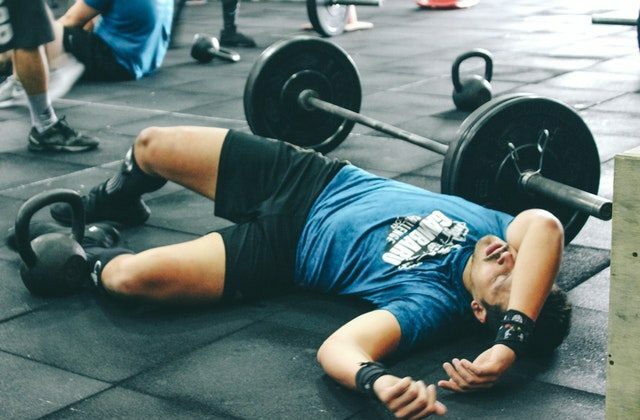 HIIT advocates often judge the quality of their workouts by how “destroyed” they feel the next day, but in some cases they may actually be destroying their bodies. “When I learned about this in school, they said, ‘You’ll never really see this,’ and then CrossFit got really big,” Marshall said. Muscles improve under strain—tiny tears in muscle tissue caused by resistance and repetition trigger it to grow back stronger when we rest. In rhabdomyolysis, the tissue never gets a chance to recover. As the overworked muscle fibers deteriorate, they are released into the bloodstream and overwhelm the kidneys with a massive amount of dead protein. This muscle-melting condition can lead to kidney failure or even death. Tehrany says feeling sore the next day is normal, especially for beginners. However, if the soreness doesn’t go away in a day or two, pay close attention. With so many factors to consider in performing a HIIT routine properly, health experts urge those taking on an intense regimen to seek the guidance of a personal trainer or a small class geared to your skill level. Marshall prefers to teach classes of no more than 10 students, so that he can closely monitor everyone’s form and make sure nobody faints. “In big classes, the coach doesn’t really have time to make sure that everyone does it perfectly,” he said. While CrossFit is best left to the more advanced crowd, HIIT can be modified for anyone, no matter what shape they’re in. Slower, more simplified HIIT routines can actually be a great place for beginners to start, because breaks are part of the pattern. “High intensity is really relative to the person working out. For someone who hasn’t worked out ever before, walking up stairs can be like high-intensity exercise for them,” Marshall said. One factor Marshall adjusts as his students progress is the ratio between work and rest. Newbies get as much rest as they need between intervals to catch their breath. Later, they move up to a 1-to-1 rest ratio—30 seconds of movement followed by 30 seconds of rest. “When you start going to a 2-to-1 [ratio]—work out for a minute and then rest for 30 seconds—that’s when you start getting that heart rate up,” Marshall said. While Marshall is a big fan of HIIT, he admits it isn’t for everybody. When it comes to making exercise a lifelong habit, he encourages people to find an activity they actually enjoy. “If you really hate high-intensity interval training, you have to find something else. You’re never going to stick with something you don’t like doing,” he said.